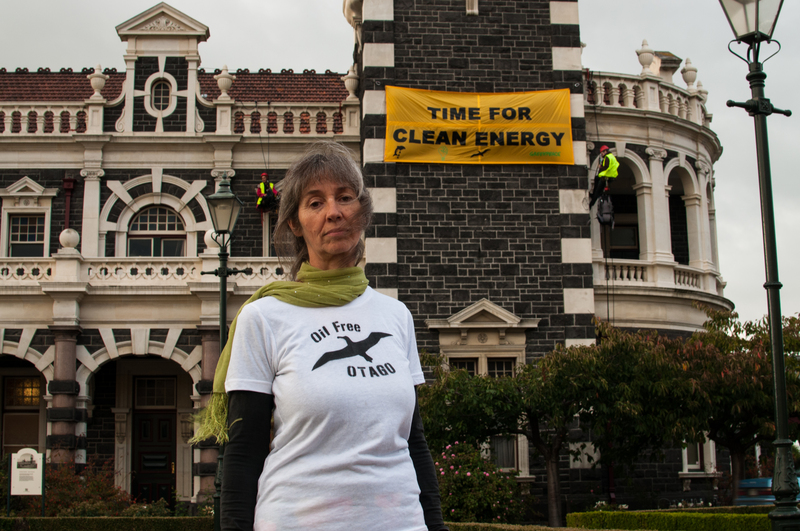 Oil Free Otago spokesperson Rosemary Penwarden stands in front of Oil free and clean energy campaigners from around the country deploying a banner from the Dunedin Railway Station clock tower. The action comes as Anadarko’s drillship, the Noble Bob Douglas, leaves for the Gulf of Mexico after failing to discover any ‘significant’ oil or gas reserves off the coast of Otago. The banner message “TIME FOR CLEAN ENERGY” highlights the need for the government to invest in clean energy projects instead of deep sea oil and gas drilling. Published March 20, 2014 at 4288 × 2848 in Clock tower climb: Time for clean energy in Dunedin.